Arthur Hopkinson was born in Sunderland in 1894 into an ecclesiastical family, his father being Canon George Hopkinson. He was educated at the English public school, Marlborough College, and then at Exeter College, University of Oxford. During the First World War he was made a Captain in the Durham Light Infantry and was mentioned in Government Despatches for the exceptional conduct of his military service. In 1920 Arthur Hopkinson entered the Indian Civil Service, where he remained until 1948. Initially he was based in the United Provinces in India but from 1924, upon transfer to the Foreign and Political Department, he was made Assistant Commissioner of Ajmer-Merawa and Assistant Political Agent of Chitral. This post continued until the end of 1926 when he set out from Gangtok to Gyantse in Tibet having been appointed Assistant Political Officer for Sikkim, Bhutan and Tibet with responsibilities also as British Trade Agent in Gyantse. This post commenced in January 1927 and lasted until May 1928. Following this post he married Eleanor, daughter of James Alaric and Kathleen Richardson. Many of the letters that he wrote to her during his time in Gyantse are now in the European Manuscripts archive of the Oriental & India Office Collections at the British Library and give a detailed and colourful account of his time in the Tibet-Sikkim trade zone. Many of the photographs in the British Museum collection are of this period and give an insight into daily life for the few British residents in the trade zone of Gyantse and Yatung. Whilst in post, Hopkinson was instructed by Political Officer F. M. Bailey to oversee the development of a motorised postal service between Gyantse and Gangtok. This proved to be a futile exercise and Hopkinson made his frustration known in his letters home. However, there are many photographs in the collection documenting his attempts. Between 1928 and 1944 Arthur Hopkinson spent most of his career in the North West Frontier Province, East and West Kathiawar States and Baluchistan in a variety of official positions. These ranged from Political Agent (East Kathiawar States, 1929-30 and West Kathiawar Agency 1939-40), Deputy Commissioner (Hazara District, 1931-2), Secretary to Chief Secretary (North West Frontier Province 1932-38). From 1940-44 he was Political Agent of the Bolan Pass. This record of government service was rewarded in 1938 with the CIE or Companion Order of the Indian Empire. 1944 saw Arthur Hopkinson return to Sikkim and Tibet as Political Officer of Sikkim, Bhutan and Tibet. He was in the post at the time of India's Independence from Britain in 1947 and remained in Gangtok until after Independence as Indian Political Officer, leaving the sub-continent in 1948. Highlights of his time in Tibet during the post-war period included a visit to Lhasa during December and January 1945-6, when he tried to discuss with Tibetan officials modifications to the McMahon Line and a cloth embargo with India. Sadly there are no photographs of this trip in the collection now held in the British Museum. 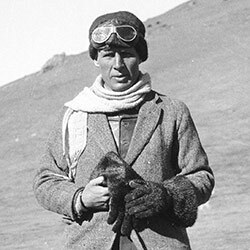 In 1948, before leaving Tibet and Sikkim for the last time, he visited Shigatse with his wife, Eleanor. The British Museum has a number of colour slides from this visit which are displayed on this website. Upon leaving government service, Arthur Hopkinson trained for the priesthood, wanting to become an Anglican priest and in 1950 he was ordained in York Minster. Between 1950 and 1953 he worked first as Curate in Whitby in North Yorkshire and then, in the last year of his life, as Vicar of Aislaby, a small town near Whitby. It was there that he died in 1953. His photographic archive was deposited with the British Museum in the early 1990s by his widow, Eleanor.